Having completely screwed up my sandbox database, I decided to do a little house cleaning. Yes, I know, I would probably break something. But I have backups now. Specifically, I wanted to reclaim some space. More specifically, I didn't like the UNDO data file being 6GB. Completely unnecessary. So I found this thread on how to "shrink" it. 1. Create a new temporary UNDO tablespace. 2. Point your database to the new UNDO tablespace. 3. Drop the original UNDO tablespace. 4. Create new UNDO tablespace matching the original. 5. 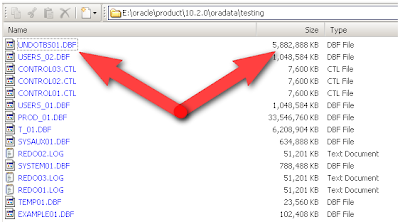 Point your database to the old new UNDO tablespace. 6. Drop the new old UNDO tablespace. And then you can remove the old datafiles. Just a reminder, this is a sandbox used for testing, not a production database. If you don't want your UNDO tablespace to reach large sizes, wouldn't it be a better idea to set a maxsize if you're going to autoextend? i am working to understand the ins and outs of this whole "DBA" thing...right now, i'm trying to concentrate on the testing portion though. The mechanisms of 10g and above always make the undo tablespace look completely filled up. Its not a bug but a documented thing. Also the shrinking may fail if the Undo tablespace would contain "active transactions"!